Come Tie-Dye a shirt with the Sharks. 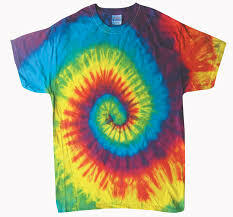 During the AM Practices, swimmers 10 and under will dye their shirts from 8:30-9:30 and then practice from 9:30-10:30. Those 11 and up (and pre-team) will practice first from 8:30-9:30 and then dye their shirts from 9:30-10:30. We will also be dyeing shirts at the evening practices. Those 9 and up (and pre-team) will dye their shirts from 5:45 until 6:45 and those 8 and under will dye their shirts from 6:45 until 7:45. You must supply your own T-shirt to dye (please no towels as they absorb too much dye) and a plastic bag for your T-shirt. The Sharks will supply all other supplies. You can purchase a plain white T-shirt at most craft supply stores, such as AC Moore or Jo-Anne Fabrics.